Home > Events > Special Events > Melbourne Cup Day 2018 – SOLD OUT!! Melbourne Cup Day 2018 – SOLD OUT!! 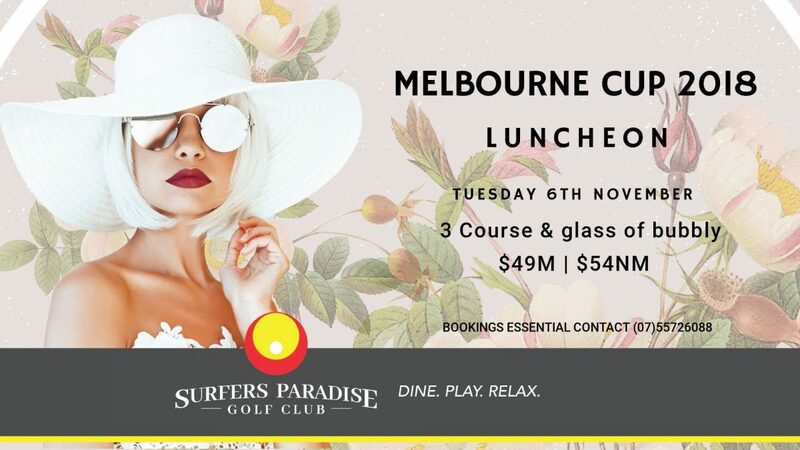 Celebrate Melbourne Cup in style at Surfers Paradise Golf Club. Enjoy all the fun and excitement of the race that stops a nation, in the clubhouse overlooking our beautiful golf course. Chef has a delicious three-course luncheon on offer which includes a glass of bubbly, $49 Members and $54 Non-Members. And with UBET now at the club, there is no reason to go anywhere else. Live entertainment, best hat, and best-dressed competitions will also be a highlight of the day, so you must dress to impress. Pork Loin oven roasted with candy apple and pear served with smashed baby potato, broccolini and rosemary jus. Book early – Limited seats available and we always sell out!